ago. She immediately made them and we all fell in love! it was all because of this easy recipe. out of making yeast breads! flour your counter and roll out the dough into a rectangle. the dough in the remaining butter. need it. I used Rosemary on these. Cover and let rise about 1/2 hour. This batch was baking while I was starting this post. There is nothing like the smell of bread in the oven. water, if it feels hot, it is too hot, if it feels cool, it is too cold. the bread enough time to rise and enough time to bake. go to any of them to see lots of great food and ideas. Definitely going to give these a try. They look amazing! They look so delish! Yum! 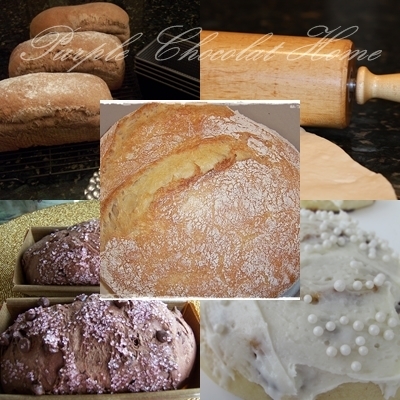 I've been baking bread too..
this is a fun post..I will make these one day..they look great! I just took these out of the oven about 15 minutes ago and we couldn't wait, so I took a couple out of the pan so they'd cool faster and they're gone and my handsome husband went back in for more! Really easy and really tasty. I used parm, chopped chives and garlic powder. I'm (we're, I should say!) looking forward to tomorrow. Thanks!! Oh boy, you know how much I love bread. This looks like a recipe that I am going to have to try in the near future. It sounds wonderful. The breadsticks look sinful...just the way I like them. Your breadsticks look absolutely perfect! I think I may have to try a whole grain version of them! Definitely going in my need to make file! These look wonderful! I am still trying to perfect my bread making skills and I will definitely be trying these out. Thanks for posting the recipe! One question...do you let the shaped rolls rise in the pan before you bake them? I'm saving this recipe for a luncheon next week- those breadsticks look gorgeous! Patricia, yes you do. I went back and corrected that. You just let them rise about 1/2 hour then bake. Sorry and thanks for pointing that out. Nice to put a face with a blog! Love baking bread and these will be delicious! Thanks for sharing..
Those bread sticks look sooo good!! Love the looks of your bread and thanks for the recipe. The bread sticks look so good. Though I'm a fan of homemade tortilla and only made Challah bread once (which turned out heavenly! ), I would love to try more bread recipes. And yours sounds too easy to be true! It's been a while since I was reading you and wanted to ask you a little something - we're in the process of decorating our home (started from nothing, actually, we just built the place) and the kitchen is such a problem! It's square. Not too big but not too small either. While I can't get myself to define the optimum workspace I have to think about the appliances - the oven bugs me big time! I can still choose between an electric one and a gas oven. How do you stand? We were going for an electric, with no doubts but then we heard people say that gas does it better.. Thank you :* sooo much! Such a delight to discover your blog! And I am so intrigued with your post on the Whipped Chocolate Bubble Bath...will definitely have to give that a try. Love all your lovely presentations too. I look forward to reading your future blog posts. Hmmmmmm, wonderful! Will definitely try these. These even taste more amazing than they look - and that was with Chase making them several years ago. I am determined to try this recipe. What a wonderful bread recipe; bread is my weakness! Thanks for making me drool tonight. I'm still a little overwhelmed by making my own bread, I'm so glad I came across u'r blog and at the right time too ... I can't wait to see the rest of it... These bread sticks look yummy!